Here are some cute and tasty looking edible baby shower diaper cakes submitted by our wonderful readers. Our readers' creativity help make this the best baby shower resource on the web! Share your own Edible Baby Shower Cake BELOW! One cake recipe that is always a huge hit at baby showers is Jell-O cake. They are a delicious cake and the main reason they are a popular baby shower cake is that you can color coordinate your cake to have either pink or blue swirls in the cake, to celebrate a girl or a boy. Or you could do swirls of both pink and blue for a mother who doesn't know what she is having! Bake the cake according to package, using a 9 x 13” greased cake pan. While cake is baking dissolve a 3-oz. package of Jell-O. (Use strawberry for a baby girl and blue Jell-O for a baby boy) in ¾ cups boiling water. Stir until Jell-O is dissolved, then add ½ cup cold water. Stir occasionally until it starts to get syrupy. While cake is still quite warm, punch holes in it with the handle end of a wooden spoon or a large tined fork. Pour Jell-O over warm cake. Let it sink in holes and around edges. Space holes about 2” apart. Place in fridge to get cold. Mix package of vanilla pudding with milk and stir until thickened. Then stir in the whipped topping until well mixed. Cover cake with topping and keep chilled. 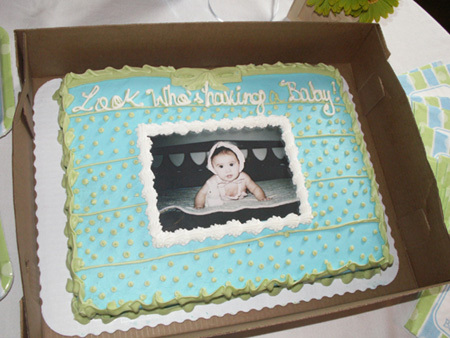 One of the most popular baby shower idea these days is baby shower cakes. They are all the rage, and after you see one, you'll understand why. They are also known as diaper cakes and baby cakes. The first thing I should mention is that you don't eat a diaper cake! If you are looking for edible baby cakes, scroll up towards the top of this page for a fabulous family cake recipe. A diaper baby cake is a collection of diapers (either disposable or cloth) rolled and stacked together to resemble a traditional tiered cake. There can be 1, 2, 3 or more tiers. The tiers of diaper cakes are also garnished with baby care items such as bibs, pacifiers, baby socks, bottles, toys, and more. 1. They are a fun and unique baby shower gift. Not very many mothers receive a diaper cake as a gift, and they are so cute! 2. Baby diaper cakes are an extremely useful baby shower gift. Every mother needs diapers, bibs, bottles, and other necessary baby items. If you were planning to give a gift of diapers, bibs, bottles, and other baby "must-haves", this can be a very cute way to present it. 3. Diaper baby shower cakes are also a wonderful baby shower centerpiece. Many hostesses use these diaper cakes as the centerpiece for the party. Then, when it comes time to open gifts, it is presented to the celebrated mother-to-be, who gets to open it and see all the baby supplies inside. 4. A baby diaper cake can be decorated to coordinate with any baby shower theme that you might have. You name it: Stars, Winnie the Pooh , little princess, Noah's Ark , Angels, Sesame Street and everything else! 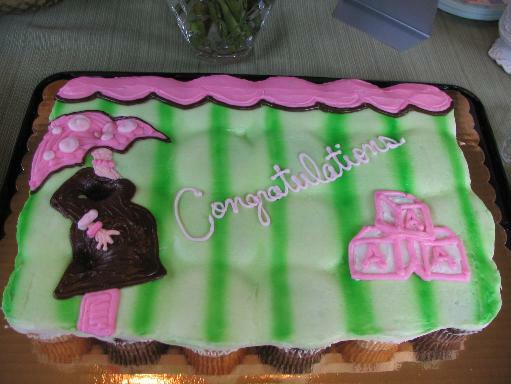 Baby Shower cakes are not an "essential" baby shower item at all. But they do add a fun and classy touch to a baby shower. Want to share your Edible Baby Shower Cake? Share your edible baby shower cake picture and/or recipe! We would love to see it! Just start typing your recipe & thoughts right here. Here is my diaper bag for my friend's baby shower. Next weekend I am trying it again ... should be much better!! She's great at making cakes. I love them. Fondant is getting VERY popular. Best wishes on your Baby Shower Party!